With thousands of undocumented children amassing at the U.S. border, Robert Jones, Imperial Wizard of the Loyal White Knights of the Ku Klux Klan, doesn’t want amnesty. He wants "corpses" on the border. The situation at the border has intensified in recent weeks as violence has forced many families to help their children cross the border for safety –– an option available due to legislation signed by President George W. Bush that gave new protections to children entering the country by prohibiting them from being quickly sent back to their country of origin, the New York Times reported in early July. In response, militia members armed with assault rifles have once again begun border patrols, and groups like the Klan, long obsessed with a white homeland, have focused their hate toward the border once again. The Klan has even established a telephone hotline with a pre-recorded message offering a list of supposed "black-on-white" crimes –– none of which have anything to do with the border. “Whites! It is time to arm yourself [sic],” the message begins. 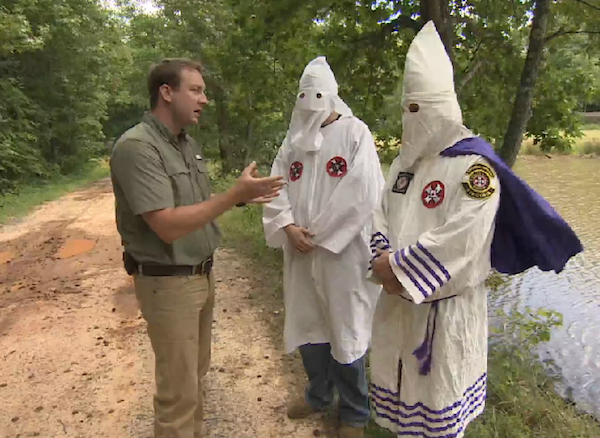 The Klan claims thousands are calling the hotline each day, including black people. Of course, for an organization that claims, "If it ain’t white, it ain’t right,” such a relationship seems improbable at best.